A 24-year-old Kuwaiti-born gunman opened fire on a military recruiting station and then proceeded to the US Naval Reserve Center where he shot and killed four Marines. The killer was identified as Mohammod Youssuf Abdulazeez who was a naturalized US citizen, born in Kuwait to Muslim Jordanian parents. It is not known whether he was radicalized by ISIS/ISIL ideology or the true nature of his motives. Some investigation of his social media postings does point to a religious bent though he was not being tracked by law enforcement under any Islamic terrorism investigation. 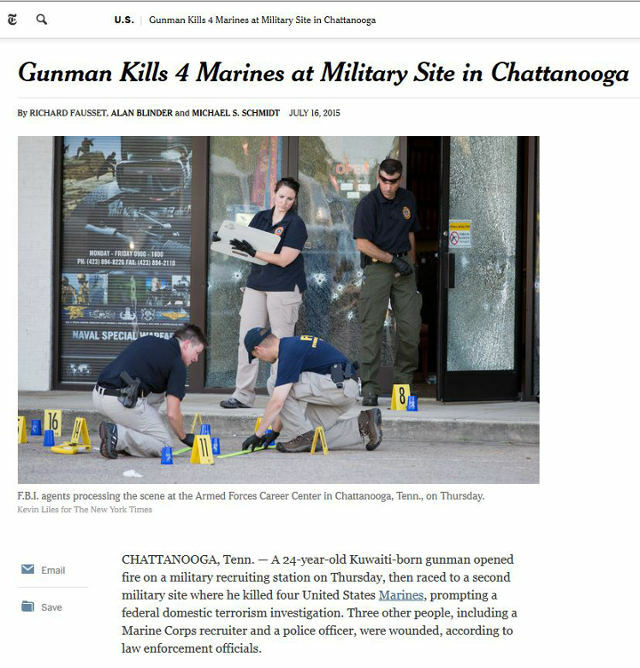 Abdulazees was killed but we still don’t have details of his death though it was likely a result of exchange of gunfire with Chattanooga police, one of whose officers was reportedly shot but is recovering. Was this Islamic terrorism or just domestic terrorism? That will likely be debated for a while. For now, the incident is also being used to test the waters for whether US military personnel should be armed while on in the United States.